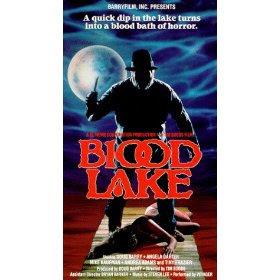 Blood Lake represents the type of direct-to-video trash that gave the slasher genre a bad name in the late 80's. It is an absolute desperate attempt to cash in on the success of the "camp-slashers" craze of early 80's. Unfortunately, it was released about five years too late and is terrible. A group of teens spend the weekend at a lakeside cabin and get murdered one by one by a fat, hillbilly killer in boots who seems to have trouble untucking his pant leg from these boots. There is nothing new or slightly original here folks. The movie plays out like a bad, bad soap opera and transcends into a laughable mess, with terrible acting and long, tedious shots of nothing happening. There is about a ten minute shot of the teens waterskiing, followed by another ten minutes of them engaged in a card game inside the cabin. The kids are annoying and are horrible, horrible actors, so no connection is made to them at all by the viewer, so when they do begin to get killed, we could care less. Worse yet, this film so obviously wants to rip off countless other horror flicks, but lacks the one fundamental thing that made these films popular: gore. The kills are absolutely bloodless, so there is nothing here even for the gorehounds to take notice of. The killer and his motives are like something out of a bad "Scary Movie" clone rather than something that is attempting to be a serious slasher film. The killer goes on his rampage because the teens parents missed a payment on the cabin!! Like slaughtering their children was really going to make them pay up! The direction is terrible, the lighting bad, and the whole thing looks like it was filmed with a cheep home video camera by a bunch of college friends on a drunken weekend. By now, this film is rare to get your hands on, and that is actually a good thing! If you do happen to come across it, please avoid it at all costs! I seriously cannot imagine anyone finding ANY redeeming qualities in this horrid mess of a film.